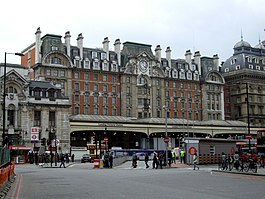 Victoria station, also known as London Victoria, is a central London railway terminus and connected London Underground station in Victoria, in the City of Westminster, managed by Network Rail. Named after the nearby Victoria Street (not the Queen), the main line station is a terminus of the Brighton main line to Gatwick Airport and Brighton and the Chatham main line to Ramsgate and Dover via Chatham. From the main lines, trains can connect to the Catford Loop Line, Dartford Loop Line, and the Oxted line to East Grinstead and Uckfield. Southern operates most commuter and regional services to south London, Sussex and parts of east Surrey, while Southeastern operates trains to south east London and Kent. Gatwick Express trains run direct to Gatwick. The Underground station is on the Circle and District lines between Sloane Square and St. James's Park, and the Victoria line between Pimlico and Green Park. The area around the station is an important interchange for other forms of transport: a local bus station is in the forecourt and Victoria Coach Station is nearby. Victoria was built to serve both the Brighton and Chatham main lines, and has always had a "split" feel of being two separate stations. The Brighton station opened in 1860 with the Chatham station following two years later. It replaced a temporary terminus at Pimlico and construction involved building the Grosvenor Bridge over the River Thames. It became immediately popular as a London terminus, causing delays and requiring upgrades and rebuilding. 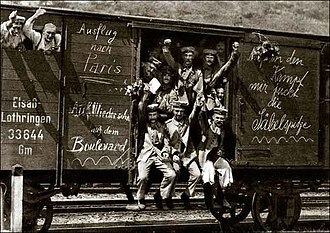 It was well known for luxury Pullman train services and continental boat train trips and became a focal point for soldiers during World War I. Like other London termini, steam trains were phased out of Victoria by the 1960s, to be replaced by suburban electric and diesel multiple unit services. Despite the end of international services following the opening of the Channel Tunnel, Victoria still remains an important London station, and its Underground facilities, in particular, suffer from overcrowding. The Gatwick Express service provides easy access between Central London and Gatwick Airport for international travellers. The station complex is in Victoria in the City of Westminster, immediately south of the London Inner Ring Road. It is located south of Victoria Street, east of Buckingham Palace Road and west of Vauxhall Bridge Road. Several different railways lead into the station line by way of Grosvenor Bridge from the south west, south and south east. It is in Travelcard Zone 1 and is one of 19 stations managed by Network Rail. It has been a Grade II listed building since 1970. Victoria Coach Station is about 300 metres south-west of the railway stations. It is the main London coach terminal and serves all parts of the UK and mainland Europe. London Buses routes 2, 11, 13, 16, 24, 36, 38, 44, 52, 148, 170, 185, 211, 390, 507, C1, C2 and C10 and night routes N2, N11, N16, N38, N44, N73 and N136 serve the station at the Victoria bus station or neighbouring streets. By 1850, railways serving destinations to the south of London had three termini available – London Bridge, Bricklayers' Arms and Waterloo. 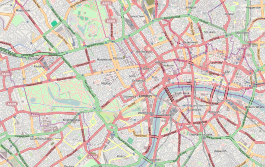 All three were inconvenient for Central London as they terminated south of the river Thames, whereas the main centres of population, business and government were north of the river in the City of London, the West End and Westminster. Victoria Station was designed in a piecemeal fashion to help address this problem for the London Brighton and South Coast Railway (LB&SCR) and the London Chatham and Dover Railway (LC&DR). It consisted of two adjacent main line railway stations which, from the viewpoint of passengers, were unconnected. The London and Brighton Railway terminus at London Bridge provided reasonable access to the City of London but was inconvenient for travellers to and from Westminster. As early as 1842 John Urpeth Rastrick had proposed that the railway should build a branch to serve the West End, but his proposal was unsuccessful. However, the transfer of the Crystal Palace from Hyde Park to Sydenham Hill between 1851 and 1854 created a major tourist attraction in the then rural area south of London, and the LB&SCR opened a branch line from the Brighton main line at Sydenham to the site in 1854. While this was under construction the West End of London and Crystal Palace Railway also planned a line from Crystal Palace, to a new station at Battersea Wharf, at the southern end of the new Chelsea Bridge. Despite its location, the new station was called Pimlico. It opened on 27 March 1858, but was very much regarded as a temporary terminus, composed of a small number of wooden huts, and positioned immediately next to a proposed bridge over the Thames. Shortly afterwards the LB&SCR leased most of the lines of the new railway, and built a further connection from Crystal Palace to the Brighton main line at Norwood Junction, thereby providing itself with a route into west London, although it was recognised that a terminus would be needed on the north side of the river. During the summer of 1857 a scheme for an independent "Grosvenor Basin Terminus" in the West End of London, "for the use of the Southern Railways of England" was mooted. The station was originally referred to as the "Grosvenor Terminus" but later renamed Victoria as it was sited at the end of Victoria Street. Three other railway companies were also seeking a terminus in Westminster: the Great Western (GWR), the London & North Western (LNWR), and the East Kent Railway (EKR). The first two already had rail access to Battersea through their joint ownership of the West London Line with the LB&SCR. In 1858, the EKR leased the remaining lines of the West End of London and Crystal Palace Railway from Shortlands railway station, and also negotiated temporary running powers over the lines recently acquired by the LB&SCR, pending the construction of its own line into west London. On 23 July 1859 these four companies together formed the Victoria Station and Pimlico Railway (VS&PR) company, with the object of extending the railway from Stewarts Lane Junction, Battersea across the river to a more convenient location nearer the West End, and the following month the EKR changed its name to the London Chatham and Dover Railway. The new line followed part of the route of the Grosvenor Canal with Victoria station on the former canal basin. It required the construction of a new bridge over the Thames, originally known as Victoria Bridge and later as Grosvenor Bridge. The bridge was 930 feet (280 m) long, which was required so that it could clear all river traffic. It was designed by John Fowler. The line was built as mixed gauge from Longhedge Junction, Battersea, to cater for GWR trains. It required a 1 in 50 climb and a 15 chains (990 ft; 300 m) turn from the LSWR main line to reach the bridge. The LB&SCR had hoped to amalgamate with the VS&PR, and introduced a Parliamentary Bill to allow it to do so in 1860. This was opposed by the GWR and LC&DR and rejected. By way of compromise the LB&SCR was permitted to lease Victoria station from the VS&PR, but agreed to accommodate the other railways until a terminus could be built for them on an adjoining site. The LB&SCR side of Victoria station opened on 1 October 1860, the temporary terminus in Battersea having closed the day before. The station was designed by Robert Jacomb Hood. It consisted of six platforms and ten tracks, with an entrance on Victoria Street. The site then covered 8.5 acres (3.4 ha) and was 800 feet (240 m) long and 230 feet (70 m) wide. The roof was built on a set of wrought iron girders, with an additional safety row that would allow the main girders to withstand a train strike. On the northwest corner of the station was the 300-bedroom Grosvenor Hotel. It was designed by J.T. Knowles, and run independently of the station itself. It opened in 1861. The LCDR and GWR opened their own station on 25 August 1862, occupying a less imposing wooden-fronted building with an entrance on Wilton Road. The Chatham line station had eight platforms, five of which were of mixed gauge, shared by broad-gauge trains of the GWR from Windsor via Southall. 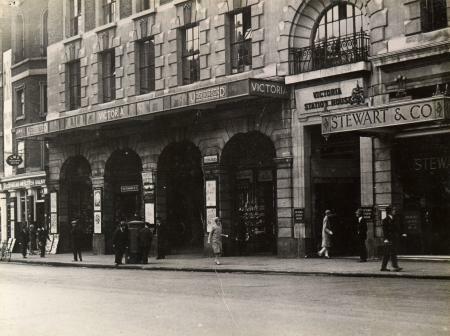 Victoria station proved to be unexpectedly popular for both the main companies, and by 1862 there were frequent delays due to congestion at Stewarts Lane Junction. In March 1863 the LB&SCR and the LC&DR jointly funded a new high-level route into Victoria, avoiding Stewarts Lane and requiring the widening of Grosvenor Bridge, including the replacement of the broad-gauge rails with a third LB&SCR line. The work was completed during 1867/8. The South Eastern Railway (SER) wanted to use Victoria as a London terminus as it was more convenient than London Bridge, but were advised they would need to pay extensive tolls and expenses to do so. Consequently, the SER constructed a station at Charing Cross instead. The GWR began services on 1 April 1863, connecting Victoria to Southall, and later some services to Uxbridge, Reading, Slough and Windsor. From 13 August 1866 the LB&SCR ran services from Victoria to London Bridge along the newly completed South London Line. 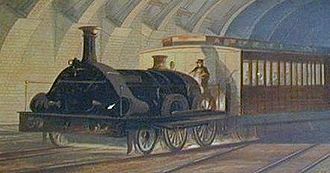 The Great Northern Railway began a service from Victoria to Barnet (via Ludgate Hill) on 1 March 1868, with other cross-London services running via Victoria in the 1870s. In 1898 the LB&SCR decided to demolish its station and replace it with an enlarged red-brick Renaissance-style building, designed by Charles Langbridge Morgan. Since widening of the station was prevented by the LC&DR station and Buckingham Palace Road, increased capacity was achieved by lengthening the platforms and building crossovers to allow two trains to use each platform simultaneously. Work was completed in 1908, and included the rebuilding of the Grosvenor Hotel at the same time. The site then covered 16 acres (6.5 ha) with 2.25 miles (3.62 km) of platforms. Overhead electric trains began to run into Victoria on 1 December 1909, to London Bridge. The line to Crystal Palace was electrified on 12 May 1911. Victoria became well known for its Pullman services during the late 19th century. The LB&SCR introduced the first Pullman first-class service to Brighton on 1 November 1875, followed by the first all-Pullman train in the UK on 1 December 1881. Another all-Pullman service was introduced in 1908 under the name of the Southern Belle, then described as "... the most luxurious train in the world...". The SECR began Pullman continental services on 21 April 1910 and on domestic services to the Kent coast on 16 June 1919. The Golden Arrow, another all-Pullman train began services in 1924, and remained in service until 30 September 1972. The London Chatham and Dover Station as rebuilt by the South Eastern and Chatham Railway. The LC&DR and GWR jointly leased the 'Chatham' portion of the station for 999 years from 28 June 1860, with the GWR responsible for 6.67%. The LC&DR completed its main line as far as Canterbury on 3 December 1860 and began to use the LB&SCR station on that day. From 1899 the LC&DR entered a working union with its rival, the South Eastern Railway, to form the South Eastern and Chatham Railway (SECR). As a result, services from its station at Victoria began to be rationalised and integrated with those from the other SECR termini. The LC&DR station began to be reconstructed in the late 19th century after several properties on Buckingham Palace Road, and the hotel, were bought by the company. Work began in 1899 with the removal of the old roof. 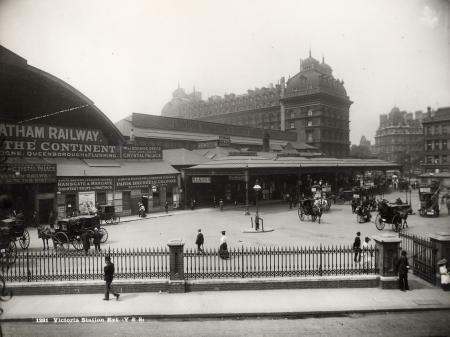 The rebuilt station was partially opened on 10 June 1906, with additional platforms and cab exit on 10 February the following year, along with a new annexe to the hotel. It was formally re-opened on 1 July 1908. As a consequence of the rebuilding, boat trains become more popular from Victoria compared to Charing Cross and Cannon Street. Services increased to serve Ostend and Calais via Dover and Rotterdam via Gravesend. The LB&SCR part of the station also served Dieppe via Newhaven. 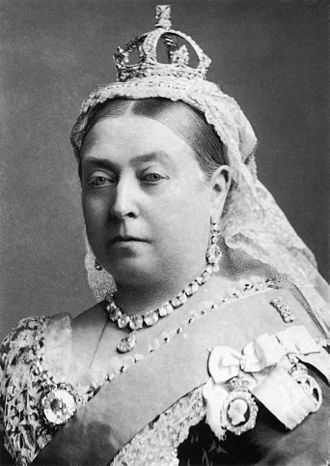 Victoria has since seen more visits from royalty and heads of state than any other London station. During the funeral of Edward VII, seven kings, over 20 princes and five archdukes were greeted here. 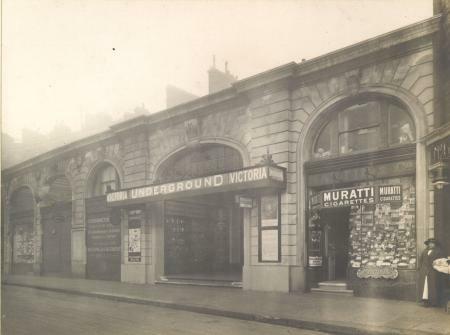 In the early 20th century, the development and improvement of the London Underground, meant that Victoria could not compete as a cross-London service. GNR trains stopped running on 1 October 1907, with Midland ones following on June the next year. The GWR ceased to use the station for scheduled services on 21 March 1915, partly due to World War I in addition to the new Underground lines. 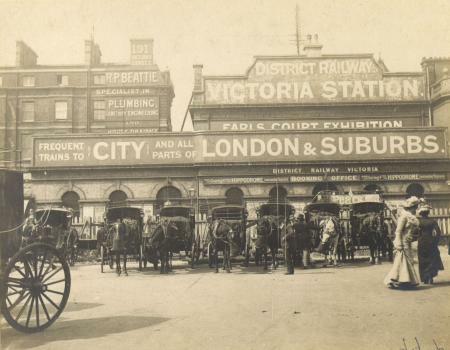 Victoria was used as the main station for drafted soldiers, and those returning from action in the war. By the middle of the war, the station served twelve trains a day running between Victoria and Folkestone, with additional trains serving Dover. The station was regularly served with a voluntary buffet for departing soldiers, who served up to 4,000 men a day. Victoria itself did not suffer significant damage during the war, but a section of Grosvenor Bridge was destroyed after an anti-aircraft shell struck a gas main underneath it. Following the war, memorials were built on both parts of the station. The Southern Railway side marks 626 soldiers killed or missing, while the Chatham side marks 556. A plaque marks the arrival of the body of The Unknown Warrior at Victoria on 10 November 1920. The service to Ostend via Dover was re-introduced on 18 January 1919. Civilian trains to Boulogne via Folkestone restarted on 3 February. Boat train services to Newhaven started on 1 June, and a connection with Paris started on 15 July. On 8 January 1920, Victoria replaced Charing Cross as the main station for Continental services, as it had more facilities and closer locomotive and carriage facilities. The service to Paris via Calais and Dover began on the same day. The two stations at Victoria came largely under single ownership in 1923 with the formation of the Southern Railway (SR) as part of the Big Four grouping. The following year steps were taken to integrate the two stations. The platforms were renumbered in a single sequence, openings were made in the wall separating them to allow passengers to pass from one to the other without going into the street, and alterations were made to the tracks to allow for interchangeable working. The work was completed in 1925, and all platforms were renumbered in a contiguous sequence. Electric suburban services to Herne Hill and Orpington first ran on 12 July that year, followed by South London line services on 17 June 1928, and electric services to Crystal Palace and Epsom (via Mitcham Junction) on 3 March 1929. The SR also concentrated Continental steamer traffic at Victoria, introducing the Golden Arrow, in 1924, and the Night Ferry in 1936. The station had a news cinema (later a cartoon cinema) that showed a continuous programme. The cinema was designed by Alastair Macdonald, son of the Prime Minister Ramsay, and was in operation from 1933 until it was demolished in 1981. The GWR remained part-owner of the station until 1932 thereafter retaining running powers, although it does not appear to have used them. Night train services stopped running from Victoria on 4 September 1939 after World War II was declared, and other services were terminated following the German invasion of France in May 1940. Though the station was bombed several times in 1940 and 1941, there was not enough damage to prevent operations. A plane crashed into the eastern side of the station on 15 September 1940 and a flying bomb caused partial damage on 27 June 1944. The greatest change to the station during the 1920s and 1930s was the introduction of third rail electrification for all suburban and many main line services, replacing the original LB&SCR overhead scheme by 1929 and largely replacing steam traction, except on Chatham Section main line and Oxted line trains. Services to Orpington were electrified in 1925 and Epsom the following year. By 1932 the Brighton main line was electrified, quickly followed by those to other Sussex coastal towns and Portsmouth by 1938. The brand name "Southern Electric" was applied to all these services. The Brighton Belle, the first electric all-Pullman service in the world, ran from Victoria from 29 June 1934 until its withdrawal in 1972. British Railways (BR) took over the station on 1 January 1948. A new set of offices for Continental trains opened on 14 June, while the eastern booking hall was renovated, opening on 5 February 1951. During the 1950s and early 1960s British Railways (Southern Region) completed its Kent Coast Electrification schemes, which meant that most of the remaining services from the station were electrified, including boat trains. Some minor services were withdrawn, and the few remaining steam services, to Oxted and beyond, were replaced by diesel-electric multiple units. Various plans were proposed at this time to redevelop Victoria, including new offices, hotels and a helicopter station. The last steam service left Victoria on 8 January 1964 to East Grinstead, after which it was replaced by diesel-electric multiple units. The station was redeveloped internally in the 1980s, with the addition of shops within the concourse, and above the western platforms as the "Victoria Plaza" shopping centre and 220,000 square feet (20,000 m2) of office space. A major re-signalling scheme was carried out during the works. The station was managed by Network SouthEast also under British Rail. The other major change to the station under BR was the gradual development of services to the new Gatwick Airport railway station after its opening on 28 May 1958. A dedicated rail-air terminal opened on 1 May 1962, designed by Clive Pascall. Several long-standing services from Victoria ended during the British Rail era. The Brighton Belle's final service was on 30 April 1972, followed by the last Golden Arrow on 30 September. The Night Ferry lasted until 31 October 1980, though the Venice-Simplon Orient Express, a luxury Pullman service, has been running intermittently since 1982. In 1984 the non-stop Gatwick Express service was started, aiming for a 30-minute journey time. This was coupled with the provision of an airport lounge and check-in facilities at first-floor level, with dedicated escalators down to the Gatwick Express platforms. British Airways and other major airlines had their own check-in desks there. British Rail operated an International Travel Centre within the main station, separate from the domestic travel centre. 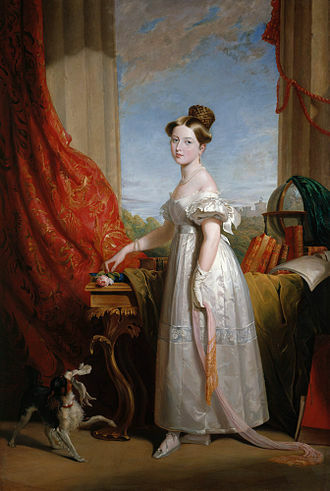 At the time, Victoria was still a major departure point for international travel, with boat trains to Dover and Folkestone for France and Belgium and beyond. This ceased with the introduction of Eurostar in 1994, which did not serve Victoria, and the International Travel Centre closed. With over 81 million passenger entries and exits in 2015/16, Victoria is the second-busiest station in London (and Great Britain) after Waterloo. Combined with the Underground Station and interchanges in the national rail station, London Victoria handled about 170 million passengers in 2015. To help passengers choose the correct service, the floor of the main concourse at Victoria is marked with different coloured lines. Passengers can then follow the line marked with the specific colour for that service to arrive at their intended departure point. The eastern (Chatham) side, comprising platforms 1–8, is the terminus for Southeastern services to Kent on the Chatham Main Line and its branches. This is also the London terminus for the Venice-Simplon Orient Express, from Platform 2, the longest platform. It was used for boat trains to Dover and Folkestone until these were made redundant by the introduction of Eurostar trains to the continent in 1994. The western (Brighton) side, comprising platforms 9–19, is the terminus for Southern and Gatwick Express services to Surrey and Sussex, including Gatwick Airport and Brighton on the Brighton Main Line and the East Grinstead branch on the Oxted Line. Services are operated by Southeastern and Southern, both owned by Govia. All services at Victoria use electric multiple unit trains. Victoria platforms 1–8 provide the London terminus for services on the Chatham Main Line operated by Southeastern, serving South East London, Kent, the South East Coast and The Medway Towns. There are typical off-peak metro services to Orpington and Sevenoaks as well as main line services to Ramsgate, Dover Priory, Gillingham and Ashford International. Victoria platforms 9–12 and 15–19 provide one of two London termini for services on the Brighton Main Line operated by Southern, serving South London, Sussex, Brighton and The South Coast. There are off-peak metro services to London Bridge and Sutton and main line services to Bognor Regis, Brighton, Epsom, Ore, Portsmouth Harbour and Southampton Central. Gatwick Express, formerly a separate franchise but now operated by Southern, runs from platforms 13 and 14. It is a shuttle service between London Victoria and Gatwick Airport every 15 minutes, and every 30 minutes services are extended to Brighton. The typical journey time is 30 minutes (up to 35 minutes on Saturdays). There is no longer an option to buy tickets on the train, following the introduction of ticket barriers in December 2011. There has been no serious accident in the immediate area around Victoria station. 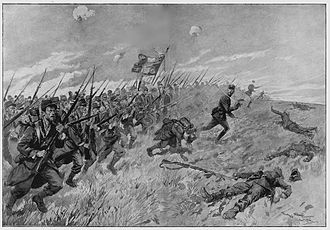 On 26 February 1884, an explosion occurred in the cloak-room of the Brighton side injuring seven staff, as part of the Fenian dynamite campaign. On 27 August 1910, an empty LB&SCR stock train derailed due to inadequate signalling arrangements, leading to four injuries. On 17 July 1946, a light engine collided with a passenger train; several people were injured. On 15 December 1959, a passenger train collided with a rake of parcels vans. At least eleven people were injured. On 8 September 1973, a Provisional Irish Republican Army (IRA) bomb exploded at the ticket office in Victoria Station, London, injuring four people. On 18 February 1991, an IRA bomb exploded in a litter bin, killing David Corner, and injuring 38. A general bomb warning for all main line stations had been received by telephone at 0700, but the Metropolitan Police Anti-Terrorist Branch chose not to close the stations. In 2009 a woman was found by a Police Community Support Officer (PCSO) acting suspiciously. When approached she produced a gun and pointed it at a passing young child. Unarmed PCSO George McNaught of the Metropolitan Police wrestled the gun out of the woman's hands before overpowering and detaining her. The woman was arrested and PCSO McNaught was awarded the commendation of the High Sheriff of Greater London for his brave actions. He is the first PCSO to receive the award. In March 2010, a youth was stabbed to death in Victoria Underground station, in front of numerous witnesses. Eight people were convicted of the killing in 2013. Three defendants were found guilty of murder and five were convicted of manslaughter. The former British ambassador to the US, Sir Christopher Meyer, claimed to have been attacked on a Tube platform at the station in July 2018. Two teenagers were arrested and then bailed by police. However a witness subsequently claimed that Sir Christopher was injured after accidentally falling over. There are two connected Underground stations at Victoria, on different levels and built more than a century apart. The older one, on the north side of the bus station, serves the District and Circle lines, constructed by 'cut and cover' methods just below road level. The newer station, closer to the main line station, serves the Victoria line, a deep-level tube. Each has its own ticket hall, and the two are connected by a pedestrian passage beneath the bus station. Victoria is currently the fourth busiest station on the London Underground with 7001793600000000000♠79.36 million passengers using the station in 2017. The station was not built for this number of passengers, which results in overcrowding requiring crowd control measures to be implemented at busy times. A £700m upgrade of the station was completed in 2018, which doubled the size of the existing station. The first part of the station was opened on 24 December 1868 by the District Railway (DR, now the District line) when the company opened the first section of its line, between South Kensington and Westminster. The DR connected to the Metropolitan Railway (MR, later the Metropolitan line) at South Kensington and, although the two companies were rivals, each company operated trains over the other's tracks in a joint service known as the "Inner Circle". The line was operated by steam locomotives, creating the necessity to leave periodic gaps open to the air. On 1 February 1872, the DR opened a northward branch from Earl's Court to the West London Extension Joint Railway (WLEJR, now the West London Line) at Addison Road (now Kensington (Olympia)). From that date the "Outer Circle" service began running over the DR. The service was run by the North London Railway (NLR) from Broad Street (now demolished) in the City of London via the North London Line to Willesden Junction, then the West London Line to Addison Road and the DR to Mansion House, the new eastern terminus of the DR.
From 1 August 1872, the "Middle Circle" service also began operation through Victoria, from Moorgate along the MR on the north side of the Inner Circle to Paddington, then over the Hammersmith & City Railway (H&CR) to Latimer Road and then to Mansion House. On 30 June 1900, the Middle Circle service was withdrawn between Earl's Court and Mansion House. On 31 December 1908 the Outer Circle service was also withdrawn. The original DR station was rebuilt at the beginning of the 20th century, initially as a single-storey structure. An office building was built above it later. The line was electrified in 1905. In 1949, the Inner Circle route was given its own identity on the tube map as the Circle line. Plans for the route that eventually became the Victoria line date from the 1940s. A proposal for a new underground railway line linking north-east London with the centre was included in the County of London Plan in 1943. Between 1946 and 1954, a series of routes were proposed by different transport authorities to connect various places in south and north or north-east London. Each of these connected the three main line termini at King's Cross, Euston and Victoria. [a] A route was approved in 1955 with future extensions to be decided later, though funding for the construction was not approved by the government until 1962. As part of the construction of the line, a new ticket hall was constructed, located just outside the main railway building. From the ticket hall, a set of escalators led down to the new Victoria line, with a connecting passageway linking the new ticket hall to the District and Circle ticket hall and platforms. 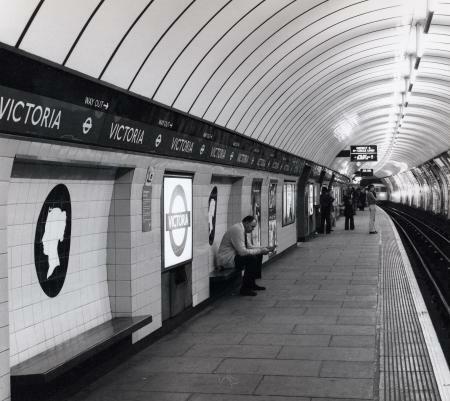 The Victoria line station opened on 7 March 1969, when the third phase of the line began operating, south of Warren Street. Victoria was the terminus while the final phase was under construction to Brixton. This opened on 23 July 1971. Victoria is one of the busiest stations on the Underground, with crowd control measures necessary in peak hours to avoid dangerous overcrowding. To alleviate this overcrowding, TfL are upgrading and expanding the station at a cost of £700m. Work includes expanding the south ticket hall and the Wilton Road entrance, and an additional entrance under Bressenden Place, along with step-free access. During the public inquiry into the station upgrade, the design of the project was criticised, as access to platforms from the new escalators will be long and indirect compared to the direct access using the existing escalators. Construction began in 2011, and tunnelling for the project was completed in 2015 after complex work – with tunnelling taking place just 60 cm from the existing District and Circle line tunnels. The first phase of the project opened in January 2017, with a new entrance leading to a new “North Ticket Hall” underneath Bressenden Place, linked to the Victoria line by new escalators and lifts. The upgrade will be completed in 2018, when the expanded south “Victoria line” ticket hall opens, providing step free access between all lines at the station. Victoria is a proposed stop on Crossrail 2, the route of which has been safeguarded since 1991. The project involves two new 250-metre (820 ft) long platforms, and new entrances onto Ebury Street and the main National Rail station. The District and Circle line ticket hall will be expanded and include a direct connection to the new station. Crossrail 2 trains will be able to reverse at Victoria. The service proposes to run 30 additional trains per hour through the station, which is expected to reduce crowding in Victoria by 25%. The Docklands Light Railway has also been planned to be linked with Victoria. For a DLR station at Victoria, it would be underground through bored tunnels leading from Bank station, where it would branch into two tunnels, the other leading to St. Pancras International station via Holborn and Euston stations. From City Thameslink station the tunnel would branch south through Charing Cross and Green Park, eventually terminating at Victoria. The tunnels would be the continuation of the Jubilee line tunnels through the former Charing Cross station. Victoria station is mentioned in Oscar Wilde's The Importance of Being Earnest as the location where Jack Worthing was found by Thomas Cardew. 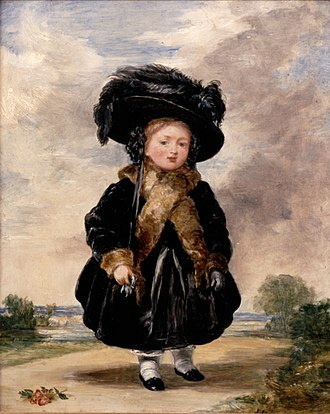 In describing this to Lady Bracknell, Jack clarifies he was named because Cardew had a ticket to Worthing, and clarifies this as "the Brighton line". The station is mentioned in the Sherlock Holmes short story "The Final Problem", when Dr Watson catches a Continental Express train from Victoria to avoid Moriarty and his henchmen. The Harold Pinter short play Victoria Station has the station as the intended destination that the driver never reaches. ^ 1.719 million of this decrease was caused by methodological changes. Without these changes, the figure would have been 82.870 million. ^ "Victoria Station". Network Rail. 26 July 2012. Retrieved 25 February 2016. ^ "The history of London Victoria station". Network Rail. Retrieved 2019-01-24. ^ "London Victoria station". Google Maps. Retrieved 2 August 2017. ^ Davies & Grant 1983, p. 48. ^ Historic England. "Victoria Railway Station – The Former London, Chatham and Dover Railway Station including Train Shed (1266689)". National Heritage List for England. Retrieved 20 August 2017. ^ "Victoria Coach Station". TfL. Retrieved 26 December 2009. ^ "Buses from Victoria" (PDF). Transport for London. 17 June 2017. Archived from the original (PDF) on 2 August 2017. Retrieved 1 August 2017. ^ "Night Buses from Victoria" (PDF). Transport for London. 18 May 2013. Retrieved 1 August 2017. ^ a b Jackson 1984, p. 268. ^ a b Jackson 1984, pp. 267–268. ^ Turner 1978, pp. 116–117. ^ a b Gray 1977, pp. 42–3. ^ Gray 1977, p. 44. ^ Gray 1977, p. 45. ^ Turner 1978, p. 121. ^ Turner 1978, p. 122. ^ a b Jackson 1984, p. 269. ^ a b Jackson 1984, p. 271. ^ "Victoria Station and Pimlico Railway". Daily News. London. 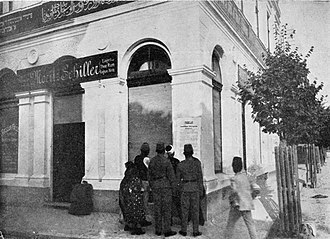 2 August 1860. ^ a b Jackson 1984, p. 272. ^ a b Gordon 1910, p. 157. ^ a b Jackson 1984, p. 274. ^ Body 1989, p. 201. ^ a b GWR Memorandum for the Board 23 January 1931. National Archives RAIL 1057/2931. ^ Gray 1977, p. 61. ^ a b Jackson 1984, p. 278. ^ Gray 1990, p. 111. ^ Jackson 1984, p. 277. ^ Betjeman 1972, p. 98. ^ Gordon 1910, pp. 157–8. ^ Bonavia, Michael R. (1987). The history of the Southern Railway. London: Unwin Hyman. p. 17. ISBN 9780043851074. ^ Turner 1979, pp. 172–5. ^ a b Jackson 1984, p. 267. ^ Martin 2014, p. 88. ^ White, H. P. (1961). A Regional History of the Railways of Great Britain: 2 Southern England. London: Phoenix House. p. 40. OCLC 271476914. ^ Gray 1990, p. 52. ^ Jackson 1984, p. 281. ^ Jackson 1984, p. 282. ^ Jackson 1984, p. 287. ^ Weinreb et al. 2008, p. 975. ^ Jackson 1984, p. 288. ^ Jackson 1984, p. 239. ^ a b Jackson 1984, p. 289. ^ "Victoria Station, London: Saying Goodbye". BBC. Retrieved 19 August 2017. ^ a b Jackson 1984, p. 290. ^ Dendy Marshall 1988, p. 396. ^ a b Jackson 1984, p. 291. ^ Martin 2017, p. 182. ^ a b c d Jackson 1984, p. 368. ^ "Railway Agreement. G.W.R. and Victoria Station". The Times (46364). London. 9 February 1933. p. 18. ^ a b Jackson 1984, p. 294. ^ Moody 1968, pp. 23–67. ^ Martin 2014, p. 89. ^ a b c Jackson 1984, p. 296. ^ Jackson 1984, p. 295. ^ Jeffs 2013, p. 8. ^ Jackson 1984, pp. 368–369. ^ Jackson 1984, p. 297. ^ Christopher 2011, p. 101. ^ Pigott, Nick, ed. (June 2012). "Waterloo still London's busiest station". The Railway Magazine. Horncastle. 158 (1334): 6. ^ "London Waterloo Set To Become the First European Terminal To Reach 200 Million Annual Passengers". The Independent. 28 December 2015. Retrieved 19 August 2017. ^ "Using Colours in Wayfinding and Navigation". Wayfinding Specialists. Retrieved 20 August 2017. ^ "London Victoria". Southeastern. Retrieved 2 August 2017. ^ "The Journey, London to Venice on the Venice Simplon-Orient-Express". Luxury Trains. Retrieved 19 August 2017. ^ Jackson 1984, pp. 287,289. ^ "London Victoria". Southern. Archived from the original on 3 August 2017. Retrieved 2 August 2017. ^ a b c "Timetables". Southern. Select an appropriate timetable to verify the route and trains per hour. Retrieved 19 August 2017. ^ "About Us". Govia. Retrieved 2 August 2017. ^ "Timetables". Select a timetable for specific information: Southeastern. Retrieved 2 August 2017. ^ "Timetables". Southeastern. Select an appropriate timetable to verify the route and trains per hour information. Retrieved 19 August 2017. ^ "Gatwick Express launches new ticket gates". Gatwick Express. 6 December 2011. Archived from the original on 18 January 2012. ^ Jackson 1984, p. 301. ^ "Dynamite outrage at Victoria Station". The Times. London. 27 February 1884. p. 10. ^ Jackson 1984, pp. 301–302. ^ Earnshaw 1989, p. 30. ^ Earnshaw 1993, p. 33. ^ "Bomb Attacks". Illustrated London News. 27 October 1973. pp. 20–21. Retrieved 1 March 2018. ^ "Provisional I R A actions Part One (1969–1975)". Memorial at Peninsula (Royal Green Jackets). Retrieved 25 September 2015. ^ Malcolm Sutton (1994). An Index of Deaths from the Conflict in Ireland 1969–1993. ISBN 0-9514229-4-4. Retrieved 12 January 2007. ^ Bell 1994, p. 786. ^ "Hero wins bravery award – PCS Comment". PCS. Archived from the original on 23 May 2013. Retrieved 26 March 2013. ^ "Gang murdered boy during rush hour at Victoria station". BBC News. 24 April 2013. Retrieved 18 July 2018. ^ "Ex-UK ambassador to US Christopher Meyer attacked in London". The Guardian. London. 12 July 2018. ^ "Teenagers did not attack former diplomat Sir Christopher Meyer — he fell, says witness". The Times. London. 17 July 2018. ^ Transport for London (January 2019). Standard Tube Map (PDF) (Map). Not to scale. Transport for London. Archived (PDF) from the original on 11 March 2019. ^ "Victoria : Axonometric Station Layout". Transport for London. Retrieved 6 August 2017. ^ a b "Tube bosses tell commuters: don't travel through Victoria at rush-hour, it's too busy". London Evening Standard. 8 March 2016. Retrieved 6 August 2017. 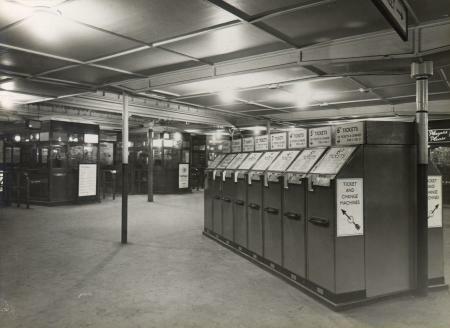 ^ "New Tube entrance and ticket hall unveiled at Victoria station". Evening Standard. 27 January 2018. ^ Demuth 2004, p. 4. ^ Glover 2003, p. 11. ^ Demuth 2004, pp. 6–7. ^ Glover 2003, p. 15. ^ Day 1979, p. 22. ^ Demuth 2004, p. 6. ^ Jackson 1986, p. 333. ^ Course 1962, p. 181. ^ Day & Reed 2010, p. 63. ^ "How old is the Circle line?". The Daily Telegraph. 6 October 2016. Retrieved 19 August 2017. ^ Day & Reed 2010, p. 160. ^ Demuth 2004, p. 24. ^ Demuth 2004, p. 26. ^ a b "Victoria station revamp to begin". BBC News. 10 June 2010. Retrieved 18 January 2018. ^ "Submissions by the Victoria Interchange Group to the Victoria Station Upgrade Public Enquiry". Persona. Archived from the original on 7 January 2011. ^ "'Major milestone' as Victoria station tunnelling work finishes". ^ Matters, Transport for London | Every Journey. "New ticket hall and entrance open at Victoria Station". Transport for London. Retrieved 18 January 2018. ^ "New entrance to Victoria Tube station opens as part of £700m upgrade". Evening Standard. Retrieved 18 January 2018. ^ "Proposed Route of the Chelsea – Hackney Line". Department for Transport. Archived from the original on 10 August 2007. ^ "Crossrail 2 factsheet: Victoria station" (PDF). Transport for London. Retrieved 20 August 2017. ^ "Safeguarding Crossrail 2 for the future". Archived from the original on 19 March 2015. ^ "Potential DLR extensions" (PDF). Transport for London. n.d. Archived from the original (PDF) on 22 March 2012. Retrieved 2 December 2012. ^ "Future TfL map in 2025". Transport for London. June 2007. ^ Wilde, Oscar (1899). The Importance of Being Earnest. L. Smithers. p. 37. ^ Wheeler, Thomas Bruce (2011). The London of Sherlock Holmes. Andrews UK Limited. p. 392. ISBN 978-1-780-92211-9. ^ Pinter, Harold (1984). "Other Places: Four Plays". Dramatists Play Service. ISBN 0-8222-0866-0. Bell, John Bowyer (1994). The Irish Troubles: A Generation of Violence 1967–1992. Dublin: Gill & MacMillan. ISBN 978-0-7171-2201-1. Betjeman, John (1972). London's historic railway stations. London: John Murray. ISBN 0-7195-3426-7. Body, Geoffrey (1989). Railways of the Southern Region. London: Patrick Stephens Ltd. ISBN 1-85260-297-X. Course, Edwin (1962). London Railways. B. T. Batsford. Christopher, John (2011). 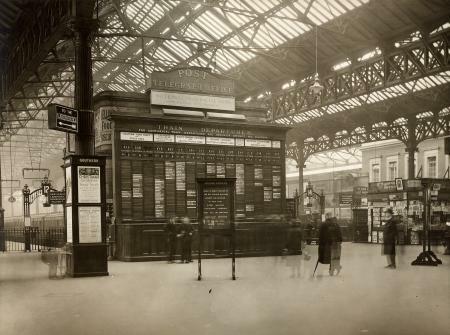 Victoria Station Through Time. Amberley Publishing Limited. ISBN 978-1-445-62431-0. Davies, R.; Grant, M.D. (1983). London and its Railways. David & Charles. ISBN 0-7153-8107-5. Demuth, Tim (2004). The Spread of London's Underground. Capital Transport. ISBN 185414-277-1. Earnshaw, Alan (1993). Trains in Trouble: Vol. 8. Penryn: Atlantic Books. ISBN 0-906899-52-4. Glover, John (2003) . London's Underground (10th ed.). Ian Allan Publishing. ISBN 0-7110-2935-0. Gordon, William John (1910). Our home railways. 1. London and New York: Frederick Warne & Co.
Gray, Adrian (1977). The London to Brighton Line 1841–1877. Blandford Forum: Oakwood Press. OCLC 4570078. Gray, Adrian (1990). South Eastern Railway. Middleton Press. ISBN 978-0-906520-85-7. Jackson, Alan (1986). London's Metropolitan Railway. David & Charles. ISBN 0-715-38839-8. Jeffs, Simon (2013). The London to Brighton Line Through Time. Amberley Publishing Limited. ISBN 978-1-445-63708-2. Dendy Marshall, Chapman F. (1988). History of the Southern Railway. Revised by R. W. Kidner (reprint of the 1963 revised ed.). London: Ian Allan. ISBN 978-0-7110-0059-9. Martin, Andrew (2014). Belles and Whistles: Journeys Through Time on Britain's Trains. Profile Books. ISBN 978-1-782-83025-2. Martin, Andrew (2017). Night Trains: The Rise and Fall of the Sleeper. Profile Books. ISBN 978-1-782-83212-6. Moody, G.T. (1968). Southern Electric 1909–1968. London: Ian Allan. ISBN 978-0-7110-0017-9. Turner, John Howard (1978). The London Brighton and South Coast Railway 2 Establishment and Growth. Batsford. ISBN 0-7134-1198-8. Turner, J. T. Howard (1979). The London Brighton and South Coast Railway: 3. Completion and Maturity. London: Batsford. ISBN 0-7134-1389-1. Wikimedia Commons has media related to London Victoria station. Gatwick Airport railway station serves London Gatwick Airport in West Sussex, England. It is on the Brighton Main Line,26 miles 47 chains down-line from London Victoria, the platforms are located about 70 metres to the east of the airports South Terminal, with the ticket office above the platforms. The station was managed by Network Rail, but in 2012 it was transferred to Southern. Train services are provided by Gatwick Express and Great Western Railway, the present station buildings British Rail logo on the top of the roof is visible from above. In terms of entries and exits in 2010/11, Gatwick Airport was the tenth-busiest station in the country outside of London. There have been two Gatwick stations sited approximately 0.85 miles from each other, the station, originally named Gatwick, was built on the present site in September 1891 to serve the Gatwick Racecourse, and originally operated only on race days. 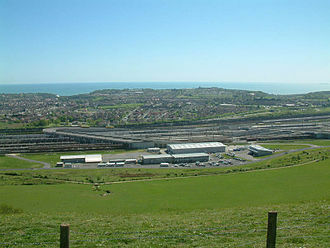 The facilities included passing loops and sidings to hold race trains without impeding the Brighton Main Line, the sidings were extended during World War I to be able to accommodate munitions trains heading for Newhaven. From 1946 until 1958, Gatwick station was renamed Gatwick Racecourse, even though racing had been abandoned in 1940, in fact the station had fallen out of use following the opening of the nearby Tinsley Green/Gatwick Airport Station. However, during the early 1950s the airport was expanded and took over the occupied by the racecourse. The new buildings opened on 27 May 1958 with a train service. The 1958 buildings included a parcels office below the concourse, lifts. 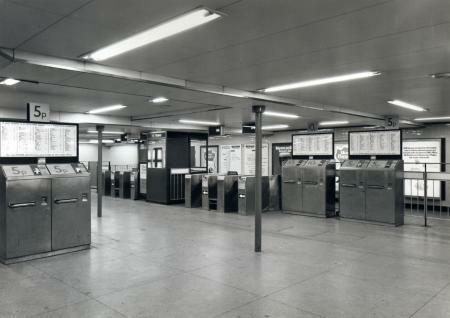 The ticket office was able to handle 670 separate issues of Edmondson tickets from its Bellmatic equipment, the signalbox was retained on the centre platform. This was opened on 30 September 1935 and was sited 0.85 miles south of the present station and it was originally named Tinsley Green but within a year became Gatwick Airport following the completion of the Beehive airport terminal which had a direct connection to the station. The airport was requisitioned by the Royal Air Force in 1940, in 1952 the British government decided that it would form Londons second airport. Pullman trains in Great Britain were mainline luxury railway services that operated with first-class coaches and a steward service, provided by the British Pullman Car Company. The coach Midland was of Clerestory Roofed design with balconies at both ends, the concept of luxury coaches spread to the other UK railway companies thereafter. The PCC was formed in 1882 and named after the Pullman concept pioneered in the United States by the American railroader George Pullman, the company entered into contracts with the railway companies to operate Pullman services over their lines. Pullman trains offered more luxurious accommodation than ordinary mainline trains, the PCC had its own workshops at Brighton. Pullman Car manufacture was carried out by Birmingham Railway Carriage and Wagon Company and Metropolitan Cammell Carriage. As Mr Smail recounts. In 1906 the LBSCR introduced three new thirty-five ton twelve-wheelers Princess Ena, Princess Patricia, and Duchess of Norfolk and these last three cars were the first Pullmans to be painted in the now familiar umber and cream livery. Hitherto the Brighton Pullmans had been painted dark brown with gold lining. Some of the cars had the name in an oval panel on the side. In 1903 Mr. Billinton changed the colour of the ordinary L. B, coaches to umber brown with white or cream upper panels, and in 1906 this colour scheme was adopted by the Pullman Car Co. with the name of the car in large gilt letters. This was the beginning of the tradition of PCC services operating with a livery and named carriages. The Great Western Railway was reluctant to use Pullmans, considering its own carriages luxurious enough, however, in 1928 the company placed an ordered for seven Pullman cars - four Kitchen Cars and three Parlour Cars, Nos 252-258 - with construction subcontracted to Metropolitan Cammell in Birmingham. Initially deployed from May 1929 on the London Paddington-Plymouth Mill Bay service, not a commercial success, the train returned for the 1930 timetable as a 3 car only service, but was withdrawn at the end of the summer timetable, with the carriages stored at Old Oak Common. Ramsgate railway station serves the town of Ramsgate in Thanet in Kent, and is at least 10 minutes walk from the town centre. The station lies on the Chatham Main Line,79 miles 21 chains down-line from London Victoria, the Kent Coast Line, the station is managed by Southeastern, which operates all trains serving it. Ramsgate railway station is a 1920s brick-built station thought to have designed by James Robb Scott and Edwin Maxwell Fry. Margate station and the demolished Dumpton Park station are of a similar design, the building is Grade II listed. Trains from Ramsgate run to London Charing Cross, London Victoria, trains first reached Ramsgate in April 1846 when the South Eastern Railway opened a line from Canterbury. It terminated at Ramsgate SER, to be called Ramsgate Town, the same year the line opened across Thanet to Margate, to Margate SER. Trains from Canterbury to Margate had to reverse at Ramsgate Town, a chord was built bypassing the station, St Lawrence station was opened in 1864 just before this chord, but closed in 1916. The London Chatham and Dover Railway reached Margate from Herne Bay in 1863 and this called at Margate C&D, East Margate and via a 1630 yd tunnel terminated at Ramsgate C&D, near the harbour and beach. This arrangement was inherited by Southern Railway on grouping in 1923, in 1926 a new line was opened connecting the SER line from east of Ramsgate Town to the LCDR line just south of Broadstairs. The current Ramsgate station and a new station at Dumpton Park were built on new line. The Ramsgate Harbour station, line through the tunnel, and the Ramsgate Town station and this change made for operational convenience, but has the disadvantage that the town centre is no longer served. The SER opened a motive power depot near Ramsgate Station in April 1846 and this was closed by the Southern Railway in 1926 and replaced by a larger facility in 1930. This closed to locomotives in 1959 and was converted for use servicing electric multiple units introduced by the Southern Region following the British Railways Kent Coast Electrification. East Grinstead railway station serves the town of East Grinstead in West Sussex, England. Only the lower level platforms remain open today, the high level having closed in 1967 with the Three Bridges to Ashurst Jn. line as part of the closure programme proposed by the Beeching Report. A third low-level platform has been constructed at the south of the station by the Bluebell Railway, Bluebell services began running south to Sheffield Park from 23 March 2013. The current East Grinstead station is the fourth to have been constructed in the town, the first station to serve East Grinstead was built by the East Grinstead Railway as the terminus of its 6-mile-67-chain single-track line from Three Bridges. It was opened on 9 July 1855 in Swan Mead off the London Road, well-situated for the town centre, with the first train out at 12,12 pm. Constructed at a cost of £3,000, the station comprised a main building which survives to this day, as well as timber goods. The goods facilities were described in a specification as being equal to those at Hailsham railway station, there were probably two platform faces and the goods yard was on the up side. The first stationmaster was a Peter Nesbitt, he remained in post until his death on 10 September 1864, the initial passenger service consisted of six trains each way daily and two on Sundays, trains started and finished at East Grinstead. The service appears to have exceeded expectations as the service increased to nine each way on weekdays, the fastest time to London was 1¼ hours achieved by the 4,00 pm down train which was first-class only. As from September 1855, an additional train was provided each way. This was increased to nine each way by 1862, the rail fare from East Grinstead to London was 6s first class and 3s third class. The line was operated from its outset by the London and South Coast Railway for a rental of £2,000 until January 1865. It was reached by steps from the road by the bridge, the station building straddled the double track with basements at platform level which contained the stationmasters office and porters room. A large brick goods shed replaced the timber structure, whilst the site of the old station became a goods yard. The Victoria line is a deep-level London Underground route running from Brixton in the south in Zone 2 to Walthamstow Central in the north-east in Zone 3 of London. It is coloured blue on the Tube map. It is one of two lines to run entirely below ground, the other being the Waterloo & City line. The line has always operated using automatic train operation. The main purpose was to relieve congestion in the central area, the necessary Private Bill was introduced into Parliament in 1955. It described a line from Victoria to Walthamstow, there was a proposal, though not included in the Bill, for a subsequent extension from Victoria to Fulham Broadway station on the District line. Construction began in 1962 on the initial Walthamstow to Victoria section, a test tunnel from Tottenham to Manor House under Seven Sisters Road had been bored in 1959 and was incorporated into the running tunnels. In August 1967 the government gave approval for the Brixton extension, preparatory work had already started at Bessborough Gardens near Vauxhall Bridge Road in May 1967. In June 1968 a proposal to build a station at Pimlico was approved, the entire Walthamstow-Brixton line was completed in 1972. The name Victoria line dates back to 1955, other suggestions were Walvic line, during the planning stages, it was known as Route C and was named the Victoria line after Victoria Station by David McKenna, whose suggestion was seconded by Sir John Elliot. It had been intended to build the line beyond Walthamstow Central to Wood Street, proposals were made to extend the line as far north as South Woodford or Woodford, to provide interchange with the Central line. However, in a decision in 1961 the line was cut back to Walthamstow station. 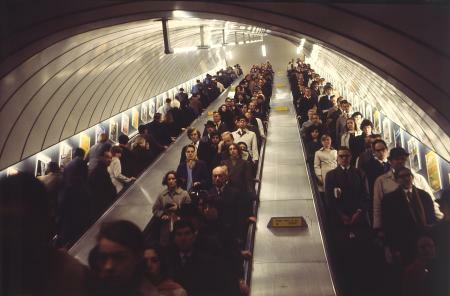 The first section to be opened was between Walthamstow Central and Highbury & Islington, there was no initial opening ceremony, instead the normal timetable started on Sunday 1 September 1968. The first train left Walthamstow Central for Highbury & Islington at about 6,30 am, that year, the section between Highbury & Islington and Warren Street was opened, again without ceremony, on 1 December 1968. Southern is the brand name used by the Govia Thameslink Railway train operating company on the Southern routes of the Thameslink and Great Northern franchise. In July 2015, the franchisee was subsumed into GTR, but the existing Southern and Gatwick Express brand identities were retained alongside those of Thameslink and it provides services between Milton Keynes and Croydon via the West London Line. It operates services from Brighton to Ashford, Brighton to Seaford, Brighton to Southampton, following the end of British Rail, Connex South Central was awarded the Network SouthCentral franchise by the Director of Passenger Rail Franchising. Operations began on 26 May 1996, in March 2000, the Shadow Strategic Rail Authority announced its intention to relet the franchise from May 2003 with Connex and Govia the shortlisted bidders. 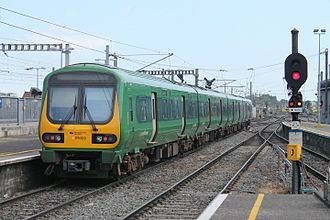 In October 2000 the SSRA announced that Govia had been awarded the franchise, Govia negotiated a deal with Connex to buy out the remainder of its franchise, this was completed in August 2001. Govia trading as SouthCentral took over operations on 26 August 2001, in May 2004 the franchise was rebranded as Southern in a recall of the pre-nationalisation Southern Railway, using a green roundel logo with Southern in yellow in a green bar. In April 2007 the Department for Transport announced that the Gatwick Express franchise was to be incorporated into the main South Central franchise. This was part of a plan to increase capacity on the Brighton Main Line, involving the extension of services from Gatwick to Brighton. This doubled the number of London to Brighton express trains during those periods, in December 2008, Southern took over the services on the Redhill to Tonbridge Line from Southeastern. However, such a transfer never took place and the DfT put out the franchise for tender. In August 2008 the DfT shortlisted Govia, National Express, NedRail, in June 2009 the DfT announced that Govia had retained the franchise, to start on 20 September 2009. In March 2012 the Department for Transport announced that Abellio, FirstGroup, Govia, MTR and Stagecoach had been shortlisted for the new Thameslink, the Invitation to Tender was to be issued in October 2012, with the successful bidder announced in spring 2013. However, in the wake of the collapse of the InterCity West Coast refranchising process, in December 2012, Southerns London Victoria to London Bridge via Denmark Hill service ceased, being partially replaced by London Overgrounds new Clapham Junction to Dalston Junction service. However the Southern brand was retained, Southern was criticised for major changes to its timetables in December 2007 and December 2008. In December 2007, Southern changed the arrangement for the splitting of services to and from London Victoria on the Arun Valley Line, in December 2008 further timetable changes included the introduction of the extended Gatwick Express services. 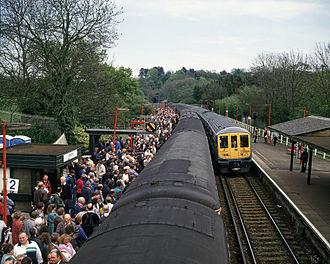 However and timekeeping on some of the new services were considered poor, on 22 January 2009, Southern responded to some of these criticisms. During 2009 these services have recorded improved timekeeping and criticisms have since subsided, the new timetable led to unhappiness due to the difference in speed and frequency of service between East Coastway services and those on the Brighton Main Line. It is 77 miles 26 chains down-line from London Charing Cross. The station and all trains that call are operated by Southeastern, in 1868 stationmaster Edward Walsh was murdered by 18-year-old Thomas Wells, a porter for the LCDR, after having rebuked him for poor work. The Southern Railway consolidated passenger services at Priory in 1927 and modernised the station in 1932, the Chatham Main Line into Priory was electrified in 1959 as part of Stage 1 of Kent Coast Electrification, under the BR1955 Modernisation Plan. The line up to Ramsgate, via Deal, was electrified under stage two of Kent Coast electrification in January 1961. The line from Folkestone into Priory was electrified in June 1961, the high-speed service to London St Pancras started in 2009, after the track in the tunnels to the south was realigned to allow for emergency evacuation from rolling stock without end doors. Services to and from Folkestone Central were suspended on 24 December 2015 due to damage to the track. A replacement bus service was in operation between the two stations, along with a modified timetable whilst repair work was carried out and this was expected to continue throughout 2016, whilst a new £44.5 million viaduct was constructed to replace the present rail embankment & sea wall. View from platform 8, looking westward towards platform one. A sign at Brighton station showing the name change from South Central to Southern in 2004. Pimlico station was the last part of the Victoria line to open, and is the line's only station that is not an interchange. Former Brighton Belle Pullman carriage at London Victoria, now part of the Venice Simplon Orient Express fleet. Note the oval lavatory window. A former East Coast Main Line Pullman car built by Metro-Cammell in 1960, now in preservation. Seen at Swanage station in 2005. An IE 29000 Class Diesel Multiple Unit on a western commuter service at Connolly Rail Station. A First Great Western British Rail Class 166 at the station, 2015. British Railways Southern Region totem sign for Chatham station. Plan of Sloane Square station, Sloane Square and surrounding streets, as they were in 1888. The River Westbourne, one of London's many subterranean rivers, flows above the station in a large iron conduit.